Confession time. Up till recently I used my twitter account to listen rather than talk; to get newsfeed from my favourite news channels in the UK, the US and Australia, follow @thebloggess (if you aren’t already, you should be the woman is a genius), follow about 20 book-themed twitter accounts and follow all of those types of social twitter types that talk about the latest places to go (love a new bar to visit!). But, attending the Social Business 2014 conference here in Melbourne, I decided that rather than take notes I would live tweet the event. And then use my tweets as notes and action points. How hard could it be I reasoned to myself? Well, let me tell you it is HARD! And stressful. And addictive! I made it through the day, having sent 85 tweets, attending ten sessions (I took notes at the first two, warming up!) although I did end up with tweet cramp. And stupidly I hadn’t brought my charger so I have to borrow one. But actually, it went well. The conference had a hashtag #SocialBiz14 (obviously, it’s a social business conference) and the delegates were encouraged to tweet the sessions using this hashtag and also tweet questions to the presenters. And for extra incentive there was a massive screen to the right of the stage, displaying tweets as they were sent. The first time I saw one of my tweets up on the huge screen, it was really quite a rush! The screen displayed up to eight tweets at a time; at one point I had three up in one go. And yes, to all those who know me as a cat tragic, I even managed to find a way to tweet a (related) photo of my cat. 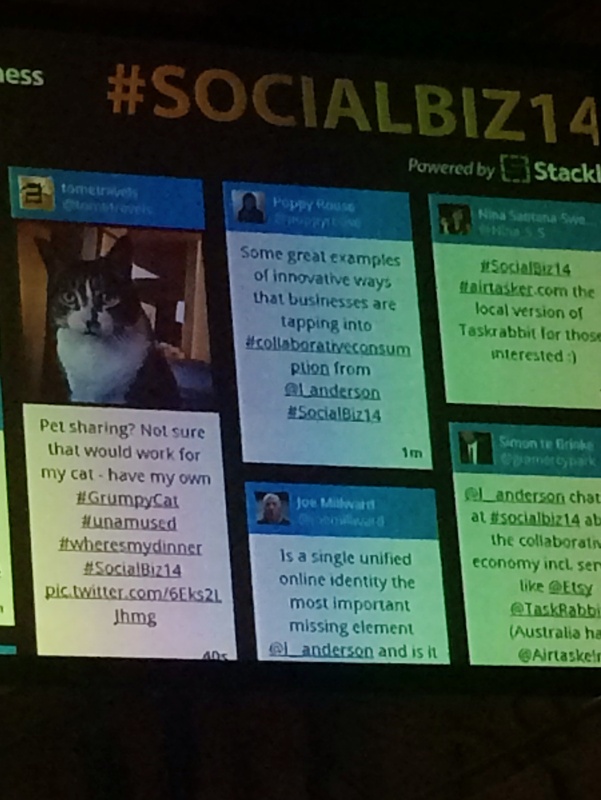 My cat, Tibbles, on the big screen, I hope he appreciates it (Grumpy Cat is always good leverage!). So what did I learn from my first attempt live tweeting? Be prepared! Know the twitter handles of the speakers, the topics under discussion, any relevant hashtags that would apply. Be consistent. Use the relevant hashtag EVERY TIME. A couple of my tweets went astray as I forgot to add the conference hashtag. Be succinct. Use sound bites from the presenters where possible. Lists are good. If they are talking about the five stages of something, tweet them. More haste, less speed. Always read your tweet before sending. Always. Typos look unprofessional and it is possible that you managed to select the wrong hashtag from the helpful auto match list that twitter supplied (I can’t tell you how many times I almost selected #sochi14 rather than #Socializ14! Oh, and have fun! I really enjoyed myself and will definitely do it again!